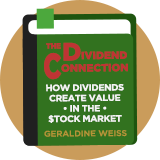 Geraldine Weiss - Known as the Grande Dame of Dividends, one of the most famous female investors in the world. Former editor of Investment Quality Trends. Author of Dividends don't Lie.. Here follow a selection of stock screening strategies that we have modelled based on the writings of or about Geraldine Weiss. These strategies are not endorsed by the author.